Trace the progress of Social Media and its influence on the media landscape - It makes up most of my research work. Master Digital Photography with valuable tips and tricks - Enhance and get more from your photos using the amazing darkroom techniques. Get Live updates from the Manipal TV Studio and its latest activities - Inputs from students and know things which can help you to master Studio Production. A well trained monkey can take snaps. Gift yourself a DSLR before someone gifts you one. Go for a short trip to historical monument, weekend getaway, busy tourist spot, you will find yourself surrounded by DSLR strutting crowd. A few days back in a cultural get together, I was lectured upon how Canon is different that Nikon as either of them (I can’t remember which one though) have better shutter speed making one of them better for wildlife photography. I forgot to ask, the wildlife photography was for hare or a tortoise. But the truth is more people aspire to have more ‘likes’ on their snaps on ‘Facebook’, some braving enough to open a fan page, all because ‘Canon’ and ‘Nikon’ believes you can be one, much to the chagrin of the professional shutterbugs. They call it a prosumer product. DSLR dumbed down to point and shoot crowd. Why? How? And if its a well thought plan, we will figure out soon. Let me start with some bare statistics - According to a recent Reuters article sales of digital cameras (and particularly DSLRs) have actually increased; Japan shipped close to three times more cameras in January of 2012 that it did 9 years ago. The difference is in the types of cameras that people are buying. Agreed, your smartphone has more ‘muscle power=pixels’ than usual, but under a situation of special moments, you are forced to take the big boy out - the suddenly affordable instrument under discussion here - Digital SLR or if you find it embarrassing when prodded further - ‘What DSLR stands for?” - Digital Single Lens Reflex. And if you want to flaunt it further - Like you know something - DSLR has a mirror inside - Yes, a mirror!! 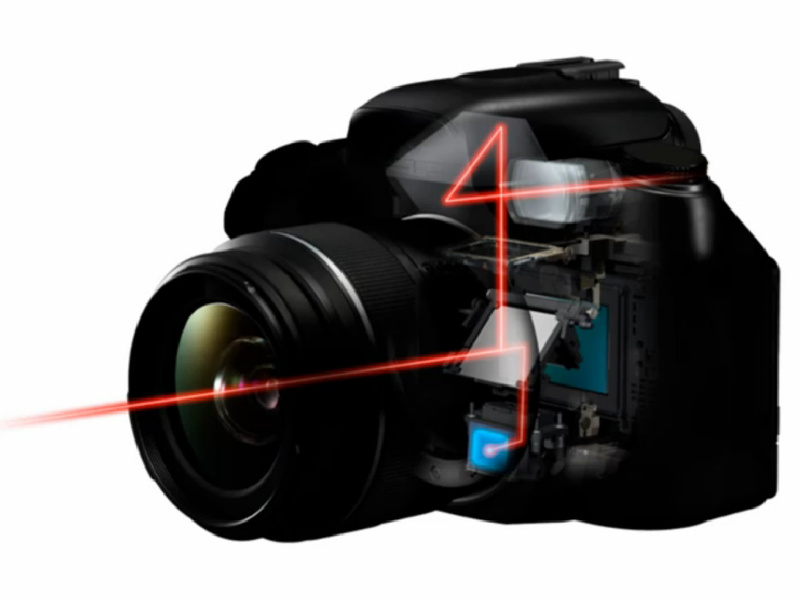 Here’s an inside look into a DSLR from alpha tutorials. The image on the left is where you can see the mirror reflecting the view from outside to the viewfinder on to the back. when you press the ‘shutter button’ or ‘click to take a photo’, the mirror lifts and exposes the image to the sensor as seen on the image right. Most of the time, these days DSLR’s are designed by folks who were designing computers, so you are saddled with design options you don’t need or at least not in the right places. For example, never purchase the one where you have to frame every picture using the back panel LCD, which will wash out in bring sunlight, and almost forces you to hold the camera at arm’s length. This makes sure, your camera has a image stabilization feature, thus forcing it to have one. Now, the image is formed when the mirror lifts itself up - exposing the ‘sensor’ of the DSLR. When the light photons are focused on the sensor by the DSLR’s, and when enough of them accumulate, it’s translated into a digital form to produce an image map you can view on the camera’s LCD and then transfer for editing. A lot depends upon the sensor, not the Megapixel. 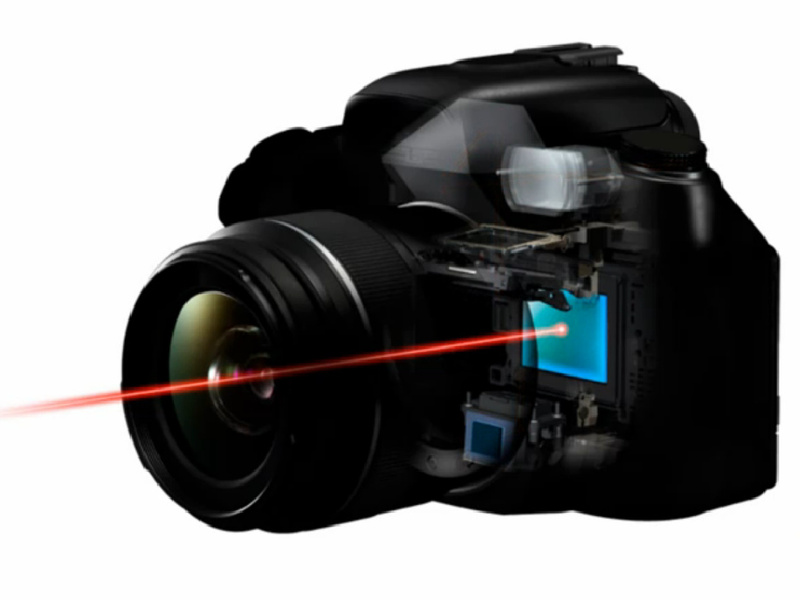 Same Camera, same megapixel will produce different photos owing mainly to the sensor along its optics. 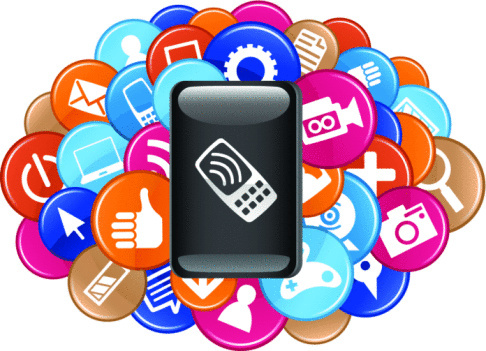 There are mainly two types of sensors: CCD (Charged Coupled Device) and CMOS (Complementary Metal Oxide semiconductor). Earlier CCD was far superior to CMOS. But now, hardly any difference persists today. So, just don’t bother what the salesman behind the counter brandishes with these acronyms. Size does matter, when it comes to sensor size. You will often hear the professional swear by “Full Frame” cameras. They are referring to the sensor size similar to the yesteryear’s 35 mm film format - 24mm X 36mm. Now, these are becoming more common and affordable. Sony, Nikon and Canon are all offering cameras with the “full frame” sensor size. We will need an another session entirely on “full frame”, which If you give me company, we will do it later. performance at high ISO settings. Larger Sensor size also increased the dynamic range in the photographs - the brighter(highlights), darker (shadow) & every tone in between. Canon is working on a 120 Megapixel with an humongous 205mm X 205mm sensor. So, coming back to the earlier discussion on Resolution relation to Quality. There’s another variable as well - “Pixel Density”. Pixel density is closely related to the pixel size – larger pixels equal lower pixel density, smaller pixels equal higher pixel density. Here’s an example: Two identical sized sensors, A - is with small pixels meaning higher pixel density. B - is with larger pixels meaning lower pixel density. Everything remaining the same. Now, A will produce low quality image when put to test with low lighting conditions meaning higher ISO conditions producing more noise. So, a camera with larger pixel size performs better at higher ISOs than a camera with more pixels and smaller pixel size. Camera - with everything same but with different needs. So, more resolution is not where the answer lies - pixel size and pixel density equally matters. Hope this simplifies your dilemma and may be you can make the salesman stutter when he’s giving you the sales pitch on investing with more pixels. Ahem!! More Pixels!! smaller pixels or larger pixels and how does it affect its pixel density? Excuse me...Let me call my supervisor!! There is a lot more twist to the story - but we will need a different feature to accommodate all of them. Happy Shopping!! Now that Dubai is calling out to you with Dubai Shopping Festival.